We knew we ran the risk of not being able to continue our 6+-year relationship with the Dish when we picked an apartment that faced woods and didn’t provide a clean line of sight, but we held out hope anyway. That hope was crushed when the Dish Network guy told us he could pick up a signal “now” but that it prolly wouldn’t pick up the signal once the trees started blooming in a couple of months. We moped around for a couple of days, lost in a hazy fog as we realized we weren’t going to be able to keep our DVRs and our awesome channel lineup. We made friends with Redbox, renting more movies in a 3-day period than we had in a year, thanks to all of the options we had from Dish. We eventually picked Comcast to be our cable (and internet) provider and that’s when it started. 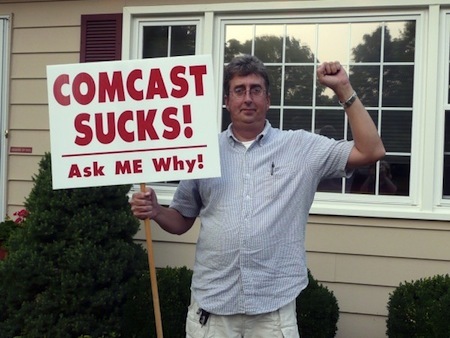 Turns out I’m not the only one that isn’t happy with Comcast. Tammy picked up the equipment and attempted to hook everything up on my first day of work. First she thought she broke the TV because it kept flashing off and on, but soon figured out it was just the box rebooting. Once the box started up, instead of being able to watch TV she was greeted with a blue screen saying the box had not been authorized and a phone number. She called the number to try to get the situation resolved but nothing seemed to work. Each time she called (4) she was given a different reason about why it wasn’t working properly, one time even being on hold for 45 minutes. Tammy was so frustrated that she called me in tears because she had been jerked around so much and still couldn’t get it to work. When I got home I swapped the original (black) box with a DVR and everything worked fine, which caused great jubilation, but by no means was it a long-term celebration. Since each of our bedrooms had two cable outlets, I figured I’d just move the black box to our bedroom so we could watch TV in bed. I hooked everything up where we wanted it to be and was greeted with nothing but a black screen. The lights on the box would turn on for about 5 seconds then go off but no signal ever made it to the TV. Since there was an outlet on the other side of the room I figured I’d just move the TV over there and could run a cable to where we wanted everything to be. That would have been perfect if that outlet had worked too, but it didn’t. So, we called and scheduled an appointment for someone from Comcast to come over so they could turn on the outlet(s) we wanted and be done with it. They were sposed to show up between 11-1 last Thursday (March 21). Did you notice I said they were “sposed to show up” because they never did. Never got a phone call, text or email about why they didn’t show up. Tammy called them on Friday and was told the reason the box doesn’t work is because there is an outage in our area. Tammy: But my other two TVs work fine. (Click here to read about my attempt to “surprise” Tammy with a TV). Comcast: Because of the outage I’m not able to send a signal to the box to activate it. Tammy: But the outlet in the room doesn’t work. The appointment was to activate the outlet. Comcast: We are showing that all of the outlets work but and once the outage is fixed we’ll be able to resend the signal to the box and everything will be fine. When I got home from work the TV in our bedroom still wasn’t working so I called Comcast to find out why no one showed up. They didn’t have a real reason as to why no one showed up and added that the ticket is “still active” but rescheduled an appointment for April 2, two weeks after our original appointment. I tried not to jump through the phone because I knew it wasn’t the operator’s fault and he said he was going to expedite the matter since no one showed up, but added that it would be 24-48 hours before someone contacted me. I got a $20 credit on my bill for all of my frustration. The rep also said he was going to forward the information to the local dispatcher and that he would be calling us in the next 30-45 minutes. We never got a call that night. The next morning (Saturday) Tammy’s phone rang and it was Comcast with a recorded message that said the outage in our area had been resolved and any appointments have been cancelled. I called Comcast back and found out that indeed our appointment, which had NOTHING to do with the outage, had been cancelled. I went into all of the problems we’ve had, how we were stood up, not called back and then had our appointment cancelled to the operator. She told me she could reschedule on the same date we had previously (April 2) and I told her I wanted it expedited like it was before because no one showed up the last time. Comcast: You do know that just because it’s expedited it doesn’t mean that someone will come out there any sooner. It’s just noted in the system and someone will call you about it. Me: I don’t care. I want it expedited. I WANT to talk to someone. Tammy took to the Twitter to voice her frustration with Comcast and how much she missed Dish Network. We weren’t really expecting a response, but she got some anyway. First by Dish Network, who said they missed us too. Comcast also contacted us and offered to help via the Twitter. At first I started doing some of the things being suggested through the Twitter. I moved the black box to the TV in my Man Cave and got the blue “not authorized” screen. I moved my DVR, which had been working, into our bedroom and it didn’t work, big surprise. The Twitter Comcast guy WAS able to activate the original box, which I was thankful for, but I nearly blew a gasket when he started asking if we had checked the connections and if we had another HDMI cable to try. Me: Are you kidding me right now? I have two other TVs that are hooked up properly but all of a sudden I don’t know how to hook this one up? Tammy: Don’t take it out on me. I’m just telling you what he said. Me: I know, I know… I’m sorry, but I just don’t get why no one understands that the damn outlet does NOT work. That’s all I want is for someone to come here and make the outlet work. Why is that so difficult? So now here we are still waiting for someone from Comcast to call us with an explanation about why they failed to show up as well, as for them to actually show up two weeks from now. In the meantime we’ll continue to “enjoy” the other fun aspects of Comcast, like having one or more channels randomly go out. That’s particularly exciting when it happens while we are watching the end of March Madness games, which has happened more than once. What our screen looked like during the good parts of the game. No, that’s not my new TV and I have never watched Law & Order. The first few times it happened I could switch from the HD channel to the “poor people” channels (standard definition) to watch the game. But then BOTH channels would go out and I wanted to throw the remote at the TV, which of course I can’t because I love my new TV and because Tammy would beat me mercilessly. There are plenty of other reasons I could go into detail on my dislike of all things Comcast (like being on hold for 20-25 minutes each time I call or having to retell my story each time, which makes me NOT want to call), but it only makes me miss the Dish all the more so I better stop. It’s as if Comcast knows they have a captive audience (people like us in apartment complexes who can’t or aren’t able to have any other choice) and they don’t care about their level of customer service. I prolly called Dish Network close to the same amount of times in 6+ years that I’ve called Comcast in the past two weeks. When I DID have to call Dish Network for something they took care of it, showed up (and on time) and seemed thankful we were customers, something Comcast could take lessons from. We’ve only been here a month and while we really love our apartment, if we had known how difficult Comcast would be, we seriously would have thought about signing a six month lease instead of 13 long, hard, difficult months. If they don’t go by quickly I guess I’ll have to unpack my books and start reading again. Sigh…. Gallery | This entry was posted in Daily Life and tagged Comcast, daily life, entertainment, humor, life, relationships, social media, Tammy, television, TV. Bookmark the permalink. Have had the exact same problem with Comcast many times. I’ve wasted days and days on them. The worst times, I insist on talking to a manager and work my way up the food chain. They gatekeep those managers like Salman Rushdie with a fatwah, but you can get them if, as soon as you get a real person on the line (in say 10 or 15 minutes, when you’re lucky), you say: I want to speak to a manager. The rep will ask why. Be prepared with a dramatic one sentence summary. Then they will usually have a manager call you back. They usually do call (give it an hour) and if they don’t, you repeat that scenario but when you get a rep you add: A manager was supposed to call me back and didn’t. My next call is to . But, yeah, they have us over a barrel and they know. I think that within 2 years, I will be able to get rid of cable altogether (’cause I have teenagers). You as a sports fan, may not be so lucky. We’ve had the service less than a month and I’m already thinking about cancelling and trying my luck with Dish Network being able to come through the trees. It’s unbelievable how they are able to stay in business with such horrible customer service. It seems like every day there is an issue that comes up and that’s not how it should be. Get an OTA antenna. That’s what we did. We canceled Comcast and haven’t looked back.